Watch this video to learn how to setup your phone numbers if you have the Enhanced Inbound or Hosted Voice add-on. Also be sure to read the sections below the video to learn about important updates. A Voice Mail feature is now available as part of the Hosted Voice upgrade. You can specify that the email address provided in the “Assigned User’s Infusionsoft ID” field should always receive an emailed copy of every inbound SMS text message, in addition to the copy turboDial sends to another User who is the intended recipient of the inbound SMS. By checking the box indicated here the Assigned User’s email address will be copied on all inbound SMSs. See this guide section for details on the “Forward to Contact Owner” feature for sending inbound calls to the owner of the associated contact record. See this guide section for details on the “Time of Day Routing” feature. The above Guide video for Enhanced Inbound does not describe an additional field now required in the second configuration screen. The “Backup Forwarding Number” is now required. This number is a direct line phone number that can be used when network or system errors prevent forwarding an inbound call according to the configuration you have provided for the Inbound Number. 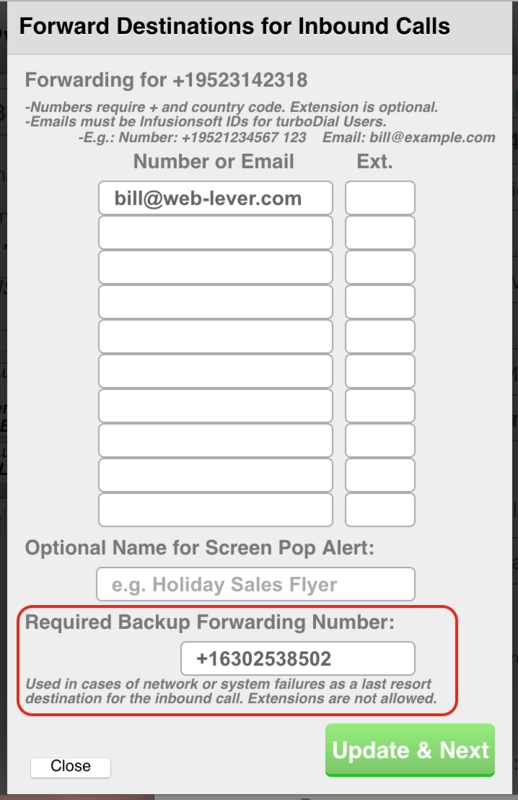 If an error is encountered while delivering an inbound call to your forwarding destinations the call will instead be delivered to the Backup Forwarding Number. Enter a phone number here that does not require an extension, and it cannot be a softphone client address. This Backup Forwarding Number is required only during certain network or system failures and provides an extra measure of assurance that your inbound calls will be delivered. You are likely never to need this extra measure of reliability. And of course this safeguard cannot ensure your calls will be delivered in all failure scenarios. Please note. The Assign Buttons can change the owner assigned to a call note record. However they will never change the owner of the contact record. In Global Options, the account owner may set an option to Add Contact on Inbound Call/SMS. See Global Options for more information. If you have the turboDial Mobile (native) app installed on your mobile device you can receive a notification alert on your device when an inbound call arrives in turboDial. See full details at this page. When adding phone numbers to the “Forwarding Destinations for Inbound Calls” screen it is strongly recommended that you do not enter numbers that require an extension. A number with an extension is OK to use if you are forwarding to a single destination. However if you are forwarding to multiple destinations then a number with an extension effectively disables the Simultaneous Ringing feature. This is because the PBX for the number with an extension will immediately answer the inbound call to ask for the extension, and by answering it stops the other numbers from ringing. See the Contact Search Tool guide for information on how to re-generate a screen pop alert for an inbound call. You may need to regenerate a screen pop if the screen pop for an inbound call is not available on your turboDial panel and you need to access the assign buttons.